Where does a foodie like me go for her birthday? Without wanting to sound presumptuous, without wanting to brag, I think I can say I’ve been around. I’ve done top restaurants (Noma – Copenhagen – DK, Oud Sluis – Sluis – NED, Per Se – New York – USA, Olivier Rollinger – Cancale – FR, Nobu – London – UK, Joël Robuchon – Paris – FR, ) around the world. And those are just the big names, with that I haven’t even mentioned the small unique ones. So when my birthday came up and I had to chose a place to celebrate with my loved ones you might wonder what will she pick now the spoiled little brat? El Bulli in Barcelona? No way! I choose local with an international twist, I choose old habits, I choose established values, I choose a time-proven restaurant. I choose my all time favorite place. I choose NZET. 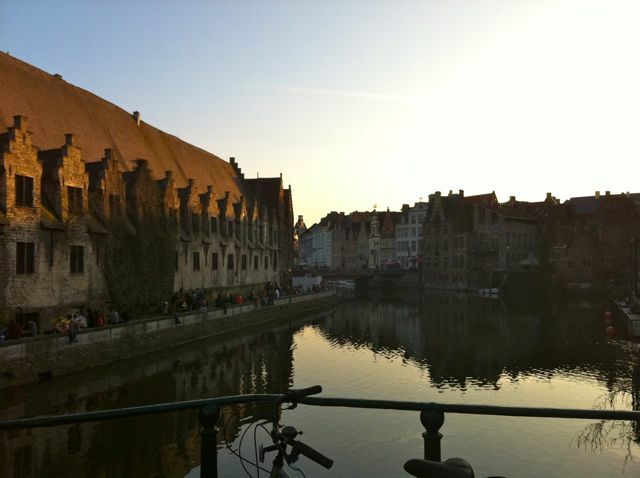 It’s a wonderful little restaurant right in the heart of Ghent. I’m cycling to the restaurant on an early spring evening in March. Just for this setting one would go there; the little cobblestone streets, the old medieval houses soaked in a golden sunset, the smell of spring in the air. Although it’s my birthday (and existential questions tend to come up on such moments) I feel like eternity is on my side. The restaurant itself is very unique too. A lovely eccentric couple, Anne Camberlin & Mauro Menichetti, runs it. I love their decoration; it’s art deco with an interesting mix and match. It’s reminds me of the set of an Edith Piaf movie. Anne loves to nose around flea markets to find authentic silver and tableware. Tables are set with real linen cloths, real silver ware and true china, but don’t expect to have the same set as your neighbor. Everyone and everything is unique. Then there is Mauro’s cuisine: top quality ingredients with interesting and exotic twists. As a real Italian he knows that less is more. A delicious tuna carpaccio doesn’t need a fancy espuma; it just needs a touch of high quality soy sauce, a twist of fresh ginger and a hint of toasted oil. 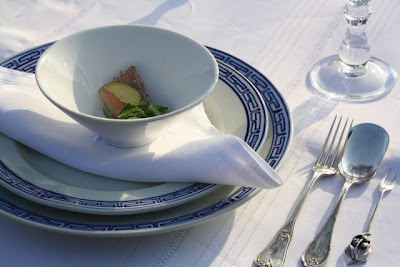 A fresh foie gras is rich and unctuous to the top. So he serves it raw and at the dinner table he oozes it with a perfect steaming dashi bouillon. The foie gras is raw and cold on the inside but melting delicious on the outside. Simple but brilliant. And finally the wines, les vins naturels… Anne guides you expertly through their grand selection of exclusive wines and the whole philosophy that’s behind this movement. The spirit of natural wines is that they are opposed to normal. They are pure. No two bottles are the same. The vignerons work the vineyards and the wine by respecting nature with all its benefits and its defaults. It’s an intensive labor, but a labor with love. And this you can feel and taste in the wine. 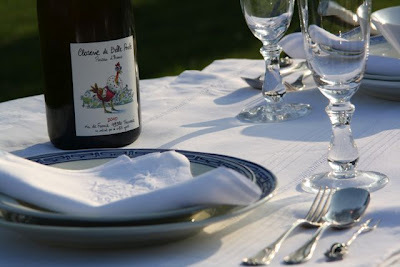 Mauro recently started his own production “Closerie de la belle poule”. He gave me one as a present. It’s a pineau d’aunis. It has wonderful pepper, clove and spice hints. Il est pétillante, méthode champenoise. Except he didn’t do the second corkage. 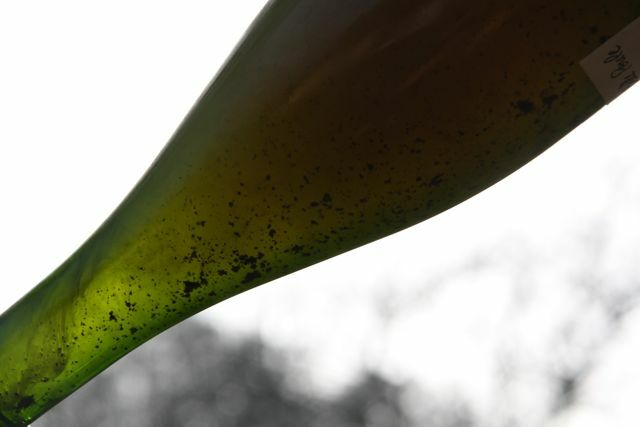 The wine still has the lees (or yeast particles inside). To help develop the taste continuously even when it’s all ready to serve at your table. To serve it you need to store it upside down so all the lees is in the top and then with a big sabre/sword fly off the cork and the lees. Adventurous… I like la! As an Nzet sample I present to you smoked eel with cucumber and toasted sesame. This is an appetizer Mauro likes to serve to tease your taste buds. The rich smoky flavor of the eel works beautifully with the fresh sweet and sour taste of the cucumber. The toasted sesame oil finishes it off flawlessly. I have tried to recreate it the best I could. It still won’t be the same as at Nzet, but getting out my grandmothers china to serve it sure helped! Anyway I feel very lucky to have such a culinary high in my hometown. Prices are not democratic here but you get top quality for sure! Cut the cucumber into very thin julienne stripes. Then put in a bowl and marinade with the mirin, rice vinegar, icing sugar, salt and sesame oil. Place in the fridge for half an hour. In the meantime toast the sesame seeds in a pan. 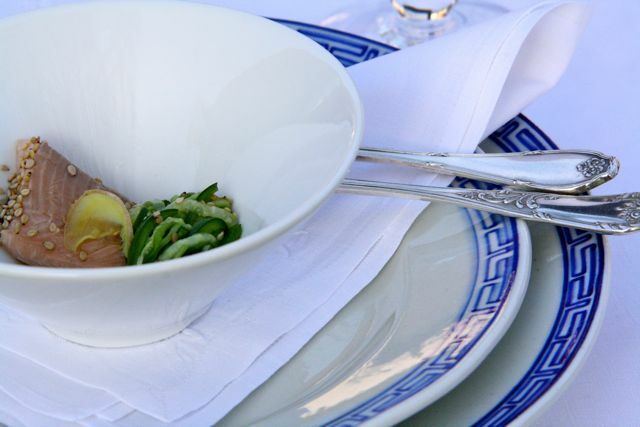 Serve a piece of the smoked eel with a spoon of the cucumber julienne and finish off with a few extra drops of sesame oil, fresh ginger and toasted sesame seeds. OK, so I forgot your birthday – very very sorry! But you seem to have done perfectly well without me! Hey, HAPPY BELATED BIRTHDAY! We have just come back from NZET! It was DELICIOUS! Great atmosphere,wonderful food.